A SEI model for hepatitis B is constructed where the susceptibility and other crucial transmission probabilities depend on the chronological age and the basic reproduction rate is derived. Under suitable (biological and mathematical) assumptions in a closed population, results of Houpa D. D. E. et al. are extended from constant case of and to age-dependent case: the disease-free equilibrium is globally asymptotically stable (GAS) if . On the other hand, induces that endemic equilibrium is GAS and the system is uniformly persistent. This paper studies a system of equations modelling the dynamic of hepatitis B with age-dependent susceptibility in a closed population. Its manifestations in human body are shown by hepatitis B antigens (small spherical particles, tubular forms and a large shelled spherical particles) because of their association with a high risk of hepatitis  . Hepatitis B caused acute hepatitis and severe chronic liver disease. Hepatitis is endemic in Africa   . According to Pasquini et al. (with a computer model), Bonzi et al. (with an EDOs model), Inaba et al. (theoretically with a PDE) or D. J. Nokes et al. (with statistics tools) and L. Zou et al. (with PDE by fitting model to data), age factor is important in epidemiology of disease like hepatitis and reveals most of time useful informations on the dynamics of the epidemic. A SEI model for hepatitis B is constructed where the susceptibility and other crucial transmission probabilities depend on the chronological age and the basic reproduction rate is derived. Under suitable (biological and mathematical) assumptions in a closed population, it is proved that the disease-free equilibrium is globally asymptotically stable (GAS) if and induces that endemic equilibrium is GAS and the system is uniformly persistent. The work is organized as follows. After the presentation of the mathematical model with its main results, Section 2 studies the well posedness of the PDE and derives preliminary results useful to study the long-term behaviour of the model. Moreover, it deals with the wellposedness of the model and proves the global asymptotic stability of the disease-free equilibrium when the basic reproduction number and stability of the endemic equilibrium (EE) with the carriers (E) transmission rate small enough to be considered as zero. These results are verified through numerical simulations extended by a discussion and conclusions in Section 3. This model (1.1) is suggested by Melnik et al. for the age-dependent susceptibility concept supplemented with Kouakep et al. introducing and . In the above model (1.1)-(1.5), we do not take into account possible vertical transmission and we do not consider any control strategy such as vaccination campaign. It seems to be relevant together the assumption of WHO  wich considers that vertical transmission of the disease exists in sub-Saharan Africa. But its influence on the dynamics of the disease is rather small because the proportion of chronic infections acquired perinatally is low  . We do not focus on chronological age in the infective classes. Assumption 1. Assume that the maps is bounded and uniformly continuous from into itself. 1. has a constant sign on . Assumption 3. has a constant sign on . 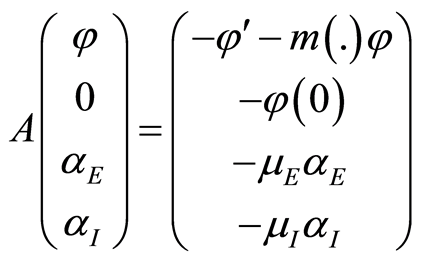 The global stability of the steady states is resumed in the following Theorem 1.  If , then the DFE, the disease free equilibrium, is globally asymptotically stable.  If , then there exists an endemic equilibrium that is globally asymptotically stable for all , and . Moreover, in that case the system is uniformly persistent. Remark 1. We will see that disease free equilibrium (DFE) exists whenever or . But endemic equilibrium exists only when . We denote in Tables 1 and 2: “p” for people(s), “yr” for year and “nbb” for “new born babies”. We made simulations with the values in Tables 1 and 2 and denoted by the constant birth rate at any positive time (with year unit). We consider the following parameters for DFE case ( related to Figures 1-3). For endemic case ( related to Figures 4-10), we consider the values in the Table 2. We have tested our Assumption 2-2 on the Figures 9 and 10 with and : it is verified in our simulations up to some time (considered as origin by time shifting or rescalling, wich is not very important in our case for long term dynamics in our simulations or calculations) with the global asymptotic stability of the endemic case . 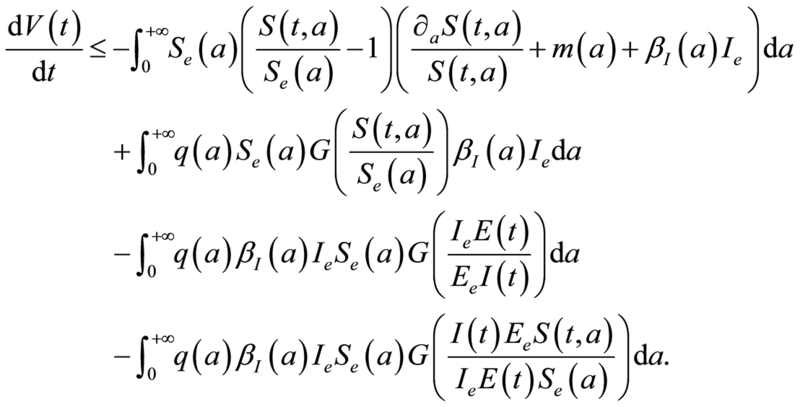 One could see that Assumption 2 and 3 could be relaxed by proving them for with an arbitrary positive real constant (or number). In all the cases, we observe a period of stability after a severe outbreak of the disease. Figure 1. Function S(t, a) with R0 < 1. Table 1. Values for R0 < 1. Table 2. Values for R0 < 1. Figure 2. Function with . Figure 3. Function with . Figure 4. Function with . Figure 5. Function with . Figure 6. Function with . Figure 7. Function with . Figure 8. Function prevalence with . Figure 9. Positivity of with . Figure 10. Positivity for long term dynamics of with . with the non densily domain in . Proposition 1. Let Mathematical Assumption 1 be satisfied. (i) (ii) for each . Remark 2. One can prove the proposition 1 by using ideas of corollaries 1 and 2 in Melnik et al.  .
By using results in Sell and You  , one can prove that is asymptotically smooth. Then using results of Hale   , Hale et al. , one obtains the following proposition. (i) is invariant under the semiflow . Moreover is locally asymptotically stable. We will widely adapt ideas of Magal et al. and Melnik et al. here with Lyapunov functionals on for the global stability of DFE and EE. Finally by global stability Lyapunov-LaSalle theorem    , the DFE = is globally asymptotically stable because the largest invariant set of orbits verifying is reduced for all positive and , to , and corresponding to the disease free steady state (DFE) seen as . Any solution of system (1.1) with positive initial condition remains positive indefinitely: then the system (1.1) is uniformly persistent (the tools are similar to Melnik  ). by using results in case , one has: . Then by global stability Lyapunov-LaSalle theorem    , the endemic equilibrium (EE) is globally asymptotically stable because the largest invariant set of orbits verifying is reduced for all positive and , to , and corresponding to the endemic steady state . We strongly believe that Assumptions 2 and 3 could be relaxed if we use usual tools of functional analysis by splitting functions and in the form as a difference of two well-chosen positive functions and . Then one can use the constant-sign cases on and . Authors are grateful to Reviewers, Pr Bekolle, Dr. A. Ducrot, Dr. Damakoa Irepran, Dr. Kamgang J. C. and GDM-MIAP group for helpful remarks or comments on the manuscript. Zuckerman, A.J. (1976) The A, B, C Viruses. Nature, 259, 363-364. Fall, A.A., Gauthier, S. and Abderrahman, I. (2010) Modélisation de la Transmission Verticale de l’Hépatite B. CARI 2010 Report. Pasquini, P. and Cvjetanović, B. (1988) Mathematical Models of Hepatitis B Infection. Annali dell’Istituto Superiore di Sanità, 24, 245-250. Zou, L., Ruan, S. and Zhang, W. (2010) An Age-Structured Model for Transmission Dynamics of Hepatitis B. SIAM, 70, 3121-3139. Kouakep, T.Y., Ducrot, A. and Houpa, D.D.E. (2013) A Model for Hepatitis B with Chronological and Infection Ages. Applied Mathematical Sciences, 7, 5977-5993. Magal, P. (2001) Compact Attractors for Time-Periodic Age Structured Population Models. Electronic Journal of Differential Equations, 2001, 1-35. Magal, P. and Ruan, S. (2009) On Semilinear Cauchy Problems with Non-Dense Domain. Advances in Differential Equations, 14, 1041-1084. Thieme, H.R. (1997) Quasi-Compact Semigroups via Bounded Pertubation. In: Arino, O., Axelrod, D. and Kimmel, M., Eds., Advances in Mathematical Population Dynamics-Molecules, Cells and Man, World Scientific Publishing, River Edge, 691-711. Hale, J.K. (1986) Asymptotic Behavior and Dynamics in Infinite Dimensions, in Nonlinear Differential Equations. Hale, J.K. and Martinez-Amores, P., Eds., Pitman, Marshfield. Hale, J.K. (1988) Asymptotic Behavior of Dissipative Systems. Mathematical Surveys and Monographs 25, American Mathematical Society, Providence. Sall Diallo, A., Sarr, M., Fall, Y., Diagne, C. and Kane, M.O. (2004) Hepatitis B Infection in Infantile Population of Senegal. Dakar Medical, 49, 136-142.